Now that we’ve created our necessary variables and we’ve prepared the “Load” event and we’ve also got our pseudocode comments written, we’re ready to turn those comments into working code. The first comment we need to convert into code involves changing what the Noughts and Crosses buttons have written inside them. Object properties are easy enough to change from the Design view of your form but what if you want them to change during the running of your program? Well this is where knowledge of variables becomes handy. And then if you want to change that “variable”, we need to use the Assignment Operator. 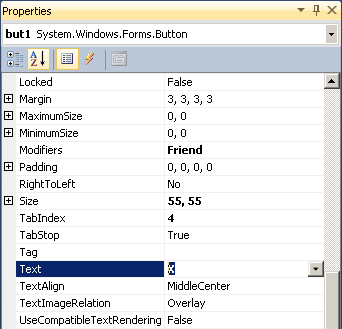 Seeing as though we’re treating these properties like variables, they need to have a data type just like any other variable and in this case, the text inside a button can be any string of characters, this means that we will treat it as though it is of the “String” data type. So with that information you should be able to go ahead and complete the first step in our “Load” event.